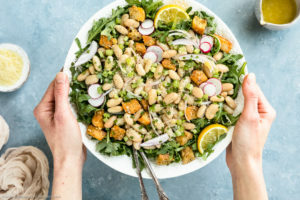 In my last post, I promised you all one more Cinco de Mayo recipe and today I am going to deliver. 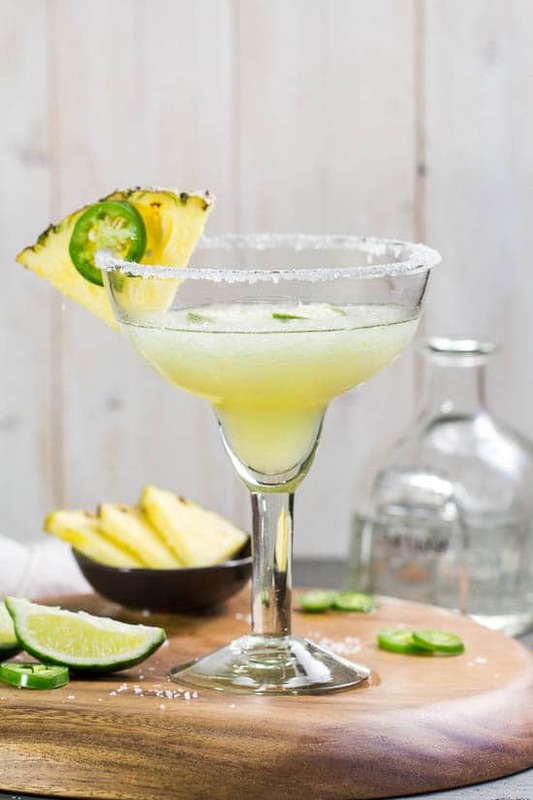 I already hooked you up with Carnitas tacos, but you can’t have a siesta-fiesta without a tequila based beverage to sip on… according to me at least. 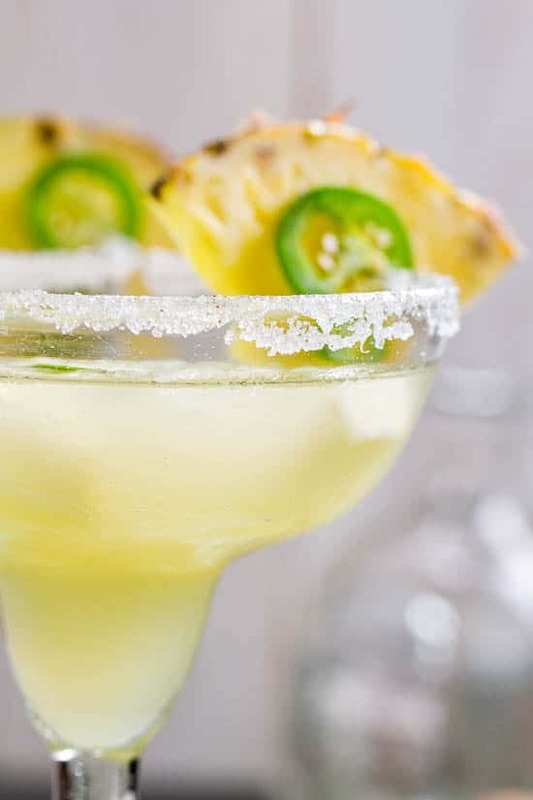 I had left over pineapple and jalapeno from the salsa (you know, the one I made to accompany the tacos), so I decided to use those two ingredients in my cocktail, for both convenience and to save you some money. Besides, those flavors are fabulous together, so why the heck not?? 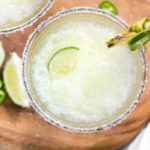 I played around with doing a few different types of tequila libations, but when it came down to it, I felt like it was loco to make any drink other than a Margarita for Cinco de Mayo. I ended up preparing you these – Pineapple, Jalapeno & Ginger Margarita Slushies. Fair warning though, this margarita slushie, as written in the recipe, is not for the faint of taste buds. It is stiff. It might give you enough liquid courage to sing La Cucaracha on a table at the top of your lungs, if you aren’t careful. If you don’t like your cocktail quite so potent, there are two ways you can dilute this drink. If you want a less heady drink, but you don’t want to sacrifice flavor, simply add more pineapple juice one ounce at a time to the mixture. Or, if you want more slush and less punch, simply blend in more ice a half a cup at a time. 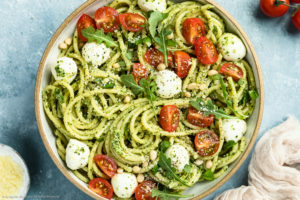 Regardless of which addition you chose, should you chose to dull the drink, you want to add and taste until the desired flavor and/or texture is achieved. Grab a sombrero and some maracas! 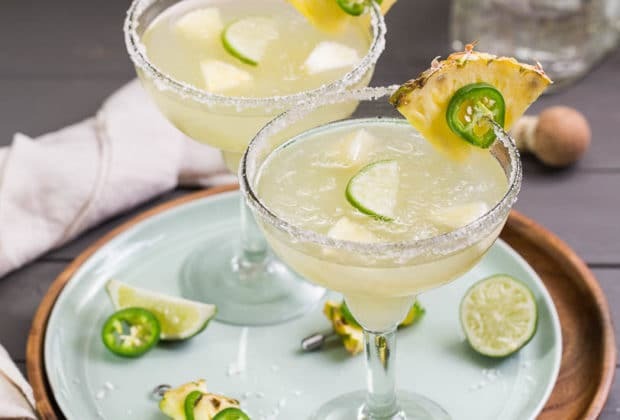 Let’s celebrate Cinco de Mayo by pouring up an icy glass of these Pineapple, Jalapeno and Ginger Margarita Slushies. Cheers friends, to magnificent Mexican food, magically delicious margaritas, and terrific times! Happy Cinco de Mayo! P.S. 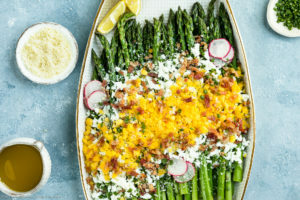 Below I have some more options for your Cinco de Mayo celebration, just in case you still need a few more dishes for your fiesta! 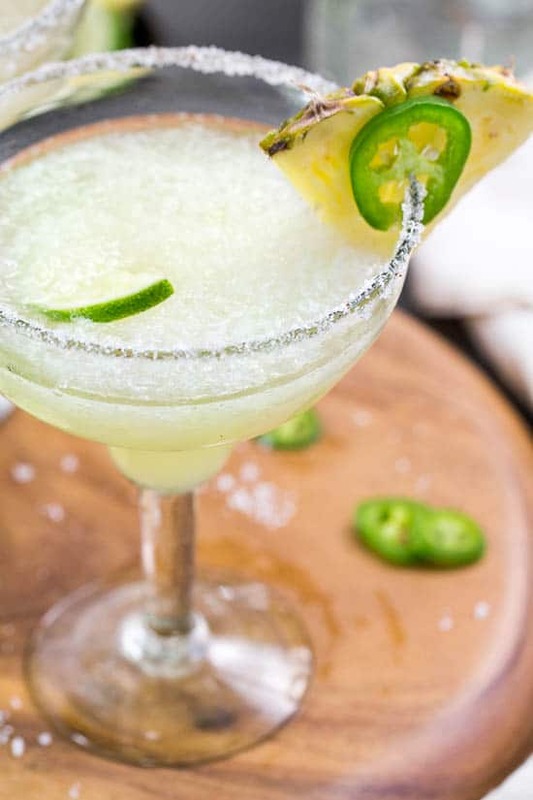 Pineapple, Jalapeno & Ginger Margarita Slushie. 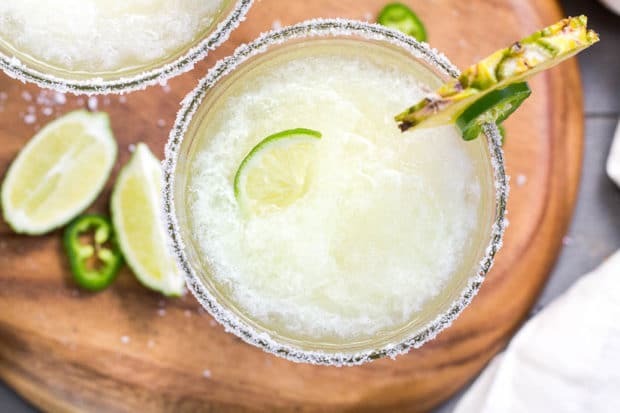 Icy cold and refreshing, these margarita slushies are perfect for summer! 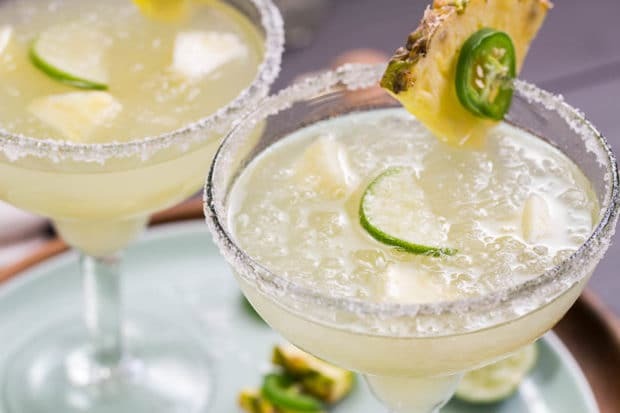 For the Margarita Mix: Combine the jalapeno flavored tequila, triple sec, lime juice, pineapple juice and 6 ounces of the ginger syrup together in a tall, freezable container with a tight fitting lid. Place container in the freezer for at least 8 hours, and up to one week. Make the Jalapeno flavored Tequila: Muddle 3 slices of jalapeno rings with tequila in a shaker. Allow to sit at least 5 minutes up to one week. When ready, strain tequila and discard jalapeno*. Make the Ginger Simple Syrup: Bring all syrup ingredients to a boil in a small saucepan. 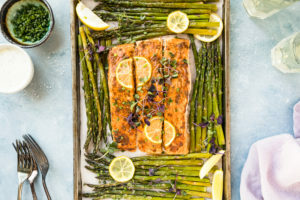 Remove from heat immediately and allow to sit, off heat, for 30 minutes or until cooled. Use an immersion blender to puree syrup. Transfer to a fine mesh strainer set over a large bowl or container and strain. Transfer to a jar or container with a tight fitting lid. 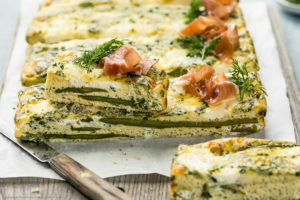 Set aside or refrigerate until ready to use. Prepare the Salt Rim Garnish: Combine the sugar, salt and cayenne together in a small ramekin or bowl, stir to mix. Set aside. 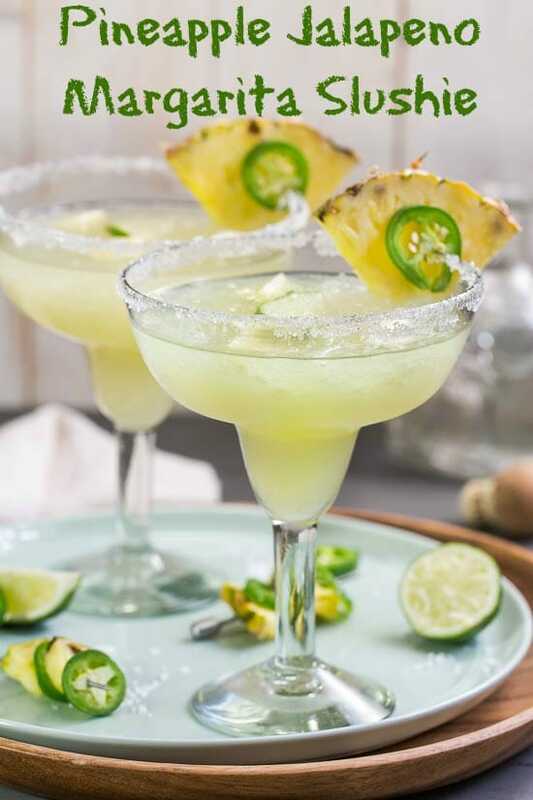 When ready to serve: Dip the rim of the margarita glass in lime juice. Roll rim in the salt garnish. Place the cocktail mix and ice in a blender. Blend until desired “slushie” consistency. 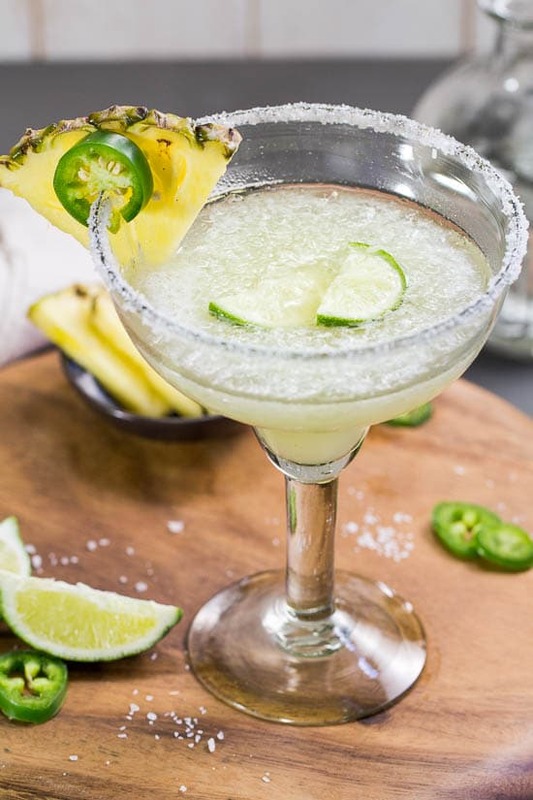 Pour margarita slushie into salt rimmed glass. 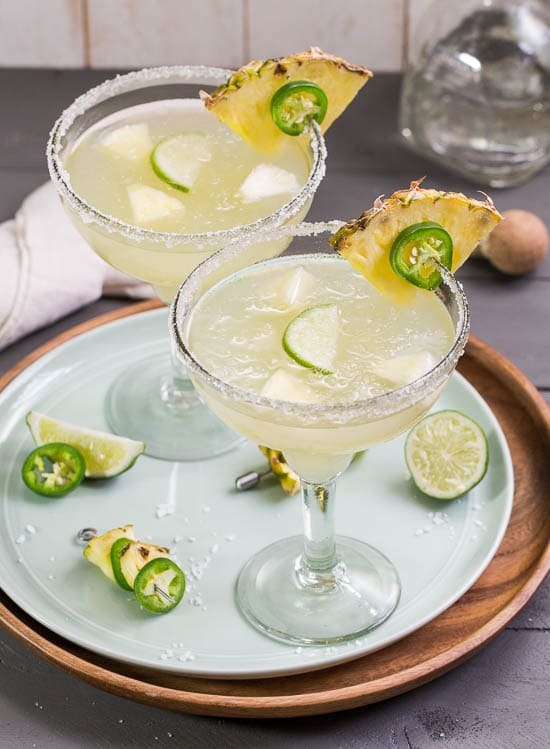 Garnish with pineapple, jalapeno and lime wedges. Enjoy. *The longer the jalapeno sits in the tequila, the spicier the tequila will be. 20 minutes of the jalapeno soaking in the tequila will render a SPICY tequila, so proceed past the 20 minute mark with caution. *The margarita cocktail mix will be very STRONG. It will mellow once blended with the ice. 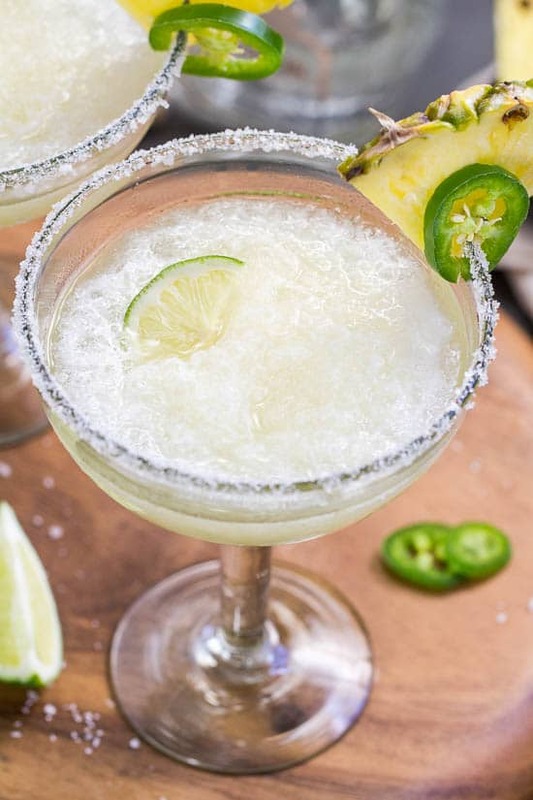 Add more ice to the blender for a weaker margarita. *The ginger simple syrup will keep, tightly covered, in the refrigerator for up to 10 days. I love the spicy, sweet, BOOZY concoction you’ve put together here. 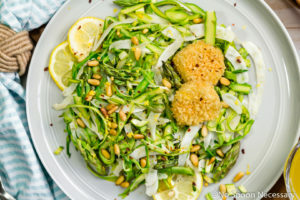 You have a great sense of humor and excellent photography skills, killer tasty recipes, keeps me coming back to check out what you’ve cooked up next.